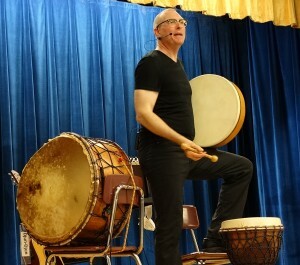 I offer many of the same DrumSongStory School Assembly Programs for Middle Schools that I offer for Elementary Schools. The difference lies mainly with the levels of comprehension. I also take a number of different approaches for Middle School audiences to break through their attempt at being “tool cool” to participate. In addition, I have developed several programs that are geared specifically for older audiences. Trickster Tales: I originally developed this Program for Jockey Hollow Middle School in Monroe CT. It is practically right out of the 7th grade Literature text book. It’s funny. It’s cool. It’s interactive. It covers a lot of geographic and cultural ground from Africa to North America and Asia. Drum of the Elephant King: A magical musical adventure story and teaching tale from Haiti, combines European and African Story Forms as it teaches a geography lesson. This program it perfect for Middle School Students because it is totally interactive but in a cool way. It ties in to a number of curriculum areas, Folktales, Slavery, Colonialism, Environmental studies, Social Studies. The Bully Proof Kid/Teen – As the classic “sensitive kid” who grew up as the target of teasing and bullying I suffered from low self esteem and intimidation even as an adult. This motivated me to learn a powerful set of personal excellence and communication tools called Neuro Linguistic Programming or NLP. In this program I use my trademark Drums, Songs and Stories to teach valuable “Modern Jedi” skills that increase students’ resourcefulness and ability stop bullying & build self esteem. “Such a fabulous Performance!! All the students (K-8) were still buzzing about it the next day. the teachers had nothing but great praise for the assembly. DrumSongStory is tops. Book Mark TodayPrefer to have me contact YOU? Simply fill out the form below! Thanks for your interest!